Jonas Price: 2 mile - 2nd and his time 9:42.09 and 1 mile - 4th and his time 4:28.77. Ronan Price: 2k steeplechase - 6th and his time 6:01.92 and All-American in the top 6 in the nation. Dillon Baker competed for the boys decathlon. He got 17th and his 4512 points. Eisenhower boys are the 2017 District Champions! 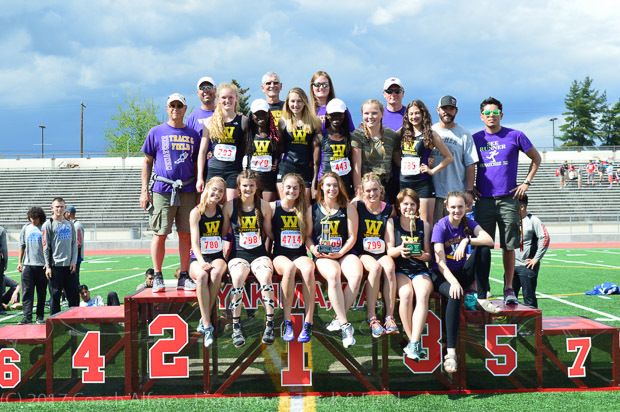 Wenatchee girls are the 2017 District Champions! 3200m - Eisenhower Ronan Price broke a set meet record - 9:48.24 in 2017! Discus - Eisenhower Brian Greene broke a set meet record - 155' 01" in 2017! 100m Hurdles - Wenatchee Elizabeth Ferrell broke a set meet record - 15.72 in 2017! 300m Hurdles - Sunnyside Jessica Linde broke a set meet record - 45.90 in 2017! 4 x 100m Relay (Girls) - Sunnyside broke a set meet record 50.38 in 2017! Long Jump - Wenatchee Ellen Ferrell broke a set meet record 17' 3" in 2017! Triple Jump - Eastmont Emily DuFour broke a set meet record 33' 8" in 2017! Eisenhower Cross Country and Track & Field - Ronan Price signed to Eastern Washington University (NCAA DI). He will compete in cross country and track in the 2018. Eisenhower Track & Field Luz A signed to Albion College (NCAA DIII). She will compete in the women's track & field in the spring 2018. Eisenhower Cross Country & Soccer - Fernando Muro signed to Skagit Valley College (NJCAA). He will play in the men's soccer in the fall 2017. 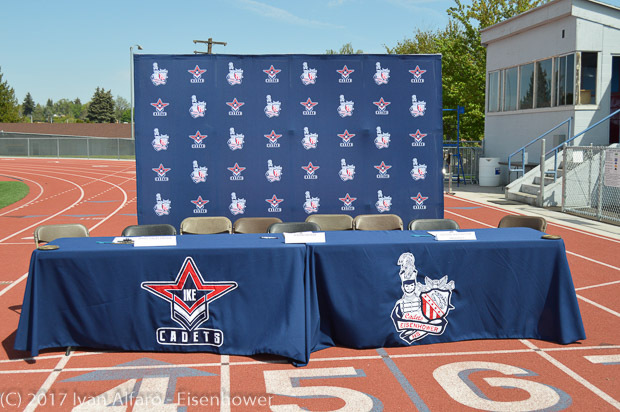 CBBN League Meet @ Eisenhower H.S. Eisenhower boys are the Big 9 League Champions! Eisenhower boys took 4th place. Eisenhower Erica Simison broke a set junior school record - 4:38.78 in the 1500m and old record Angela Talarico 4:50.40 in 2000. Eisenhower Jonas Price broke a set frosh school record - 9:32.76 in the 3200m and old record Robbie Barany - 9:42.0 in 2002. Eisenhower Jonas Price broke a set frosh school record 4:24.08 in the 1600m and old record Micah Kurtz - 4:29.1 in 1996. Eisenhower Erica Simison broke meet record - 7:47.50 & set a school record in the 2k steeplechase and old record Hanford Hailey Cleavenger - 7:56.26 in 2016! 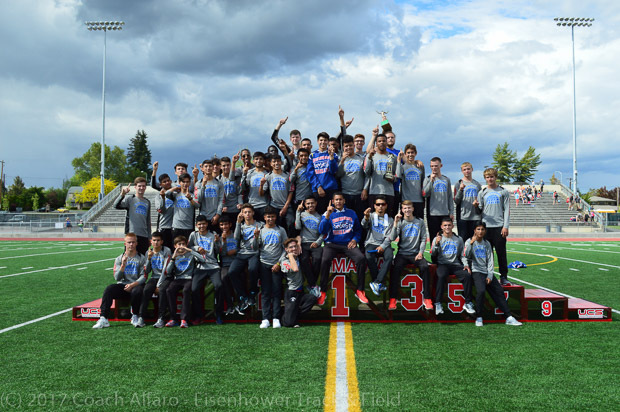 Eisenhower boys took 1st in the Boys team division. Ronan Price broke a set meet record - 6:07.03 for the 2k steeplechase! Eisenhower’s Ronan Price won the 2,000-meter steeplechase by more than a minute over the next closest competetor at the Eisenhower Jamboree on Saturday at Zaepfel Stadium. Price was also part of the Cadets’ winning 600-400-200-800 relay team, one of three relay victories for Eisenhower. Lyle-Wishram’s Brandon Montoya claimed victories in both the 100-and 300-meter races, while Ike’s Kaitlyn Ditter won both the 55-meter hurdles and high jump events.